Sophomore Jaada Valley drives in for a layup Tuesday night as she finished with 17 points helping the Trojans cruise past Liberal 57-13. Tuesday night, the Girard Trojans made their home debut as they faced off against the Liberal Bulldogs. 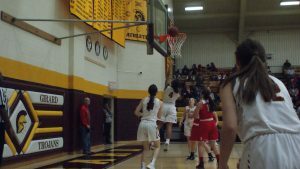 In the Lady Trojans last game, they narrowly escaped the Parsons Vikings. But this game was a completely different story as the Trojans dominated both sides of the ball. In the first, the story was Girard’s defensive presence as they applied heavy pressure to the Bulldogs forcing multiple turnovers then converting those into fast break points. Girard established their inside presence early as well with freshman Faith Poland, junior Brittley Bailey, and senior Kalyn Flaharty. Key performances from Tuesday’s game came from sophomore Jaada Valley, who forced multiple turnovers and finished the game with 17 points as well as freshman Faith Poland who finished with a game-high 18 points. The Lady Trojans went on to defeat the Bulldogs 57-13, improving to 2-0. “Very pleased with tonight’s performance, we need to work on our half-court offensive execution, but defensively I don’t know that we can play much harder or better,” said Coach Brad Herlocker. On the boys’ side, the Trojans are coming off an impressive overtime victory over the Parsons Vikings. It was much of the same as the Lady Trojans as the boys dominated the floor defensively as well as offensively. It was an offensive explosion for the Trojans as the Bulldogs defense was completely outmatched with the Trojan’s size and speed. Girard went on an 18-0 run before halftime which ultimately pushed the Trojans away to victory over the Bulldogs. Senior Caleb Muia led all scorers as he finished the game with 29 points. Ryder Worrell and Carter Doherty also scored 10 points each. “Thought our kids played hard tonight, we had several mistakes…but we can learn a lot from tonight’s game,” said Coach Rod Wescott. Girard will travel in their next matchup as they face the Galena Bulldogs in a conference matchup, Friday, December 4.